Spine - a basic element of the human skeleton. Spinal injuries are dangerous especially spinal cord injury. Closed (without damage to the skin and tissue covering the vertebrae) and open (gunshot wounds, woodlogs bayonet wounds, etc.). Are topographically distinguish different injury spine: cervical, thoracic and lumbar. traumatic spondylolisthesis (gradual displacement of the vertebrae anteriorly due to the destruction of the ligamentous apparatus). Also, spinal injuries can be divided into uncomplicated, without damage to the spinal cord, and complicated, accompanied by paralysis, impaired sensation and pain in the limbs. In addition, the great clinical importance is the distinction between stable and unstable injuries. Unstable spinal injury - a condition in which the deformation after the injury in the future can be exacerbated. Instability injuries include sprains, subluxation, spondylolisthesis, and injury from shear and stretching. The main symptoms at which possible spinal injury: pain in the neck and lower, loss function of limb, loss or alteration of pain. Signs shock of spinal (slow pulse and low blood pressure), general lethargy of the limbs, straightening of limb, possible loss of control of urination and faeces. In the case of complicated fractures of the vertebrae surgical treatment as early as possible: the earlier will be produced the operation, the higher the probability of full recovery of the functions of the spinal cord. Conservative treatment. In uncomplicated fractures in thoracic and lumbar spine possible conservative treatment, with the condition of external immobilization or fixation, during 12 months from the moment injury. 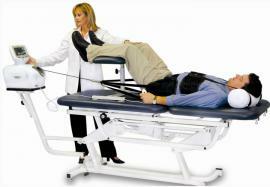 In the cervical spine the immobilization is necessary up to 6 months. Surgical treatment. For patients who lead an active lifestyle, surgical treatment is usually performed even in uncomplicated spinal injuries. Modern surgical techniques allow the patient to return activity at 5-7 day from the moment surgery, and during surgery on the cervical - 1 day. The duration of the rehabilitation period in these patients amounts to 6 weeks after the operation, after which they return to normal life.